You got the news; one of your dearest friends is having a baby girl. So, you decide to gather all of her friends and family and plan a baby shower. Everyone is excited for welcoming the little princess. Now your job is to throw a baby shower that will wow everyone especially the mommy. This is a fun celebration, so your planning should also be fun. There is a list of things to you need to know to plan this party. Thankfully you have lots of ideas on this site. 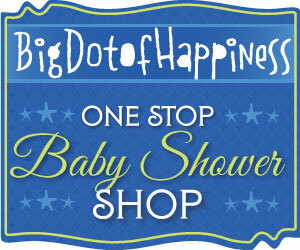 Check out baby shower planning to guide you on how to organize a baby shower. You want to make this event special so you might consider having a theme based party. There are different types from traditional to modern baby shower themes for girls. Luckily there are so many themes you can pick from; princess, elephant, owl, hot pink with chevron…possibilities are endless. Of course you can come up with something totally unique. 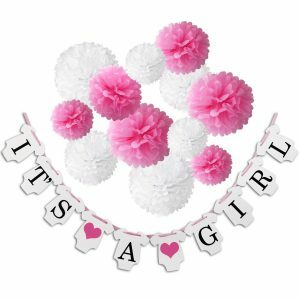 Here is a list of girl baby shower themes. 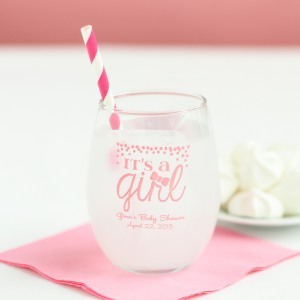 Depending on where you will celebrate this occasion; home, hall or restaurant, you must remember to also include the mom-to-be in the baby girl shower ideas. 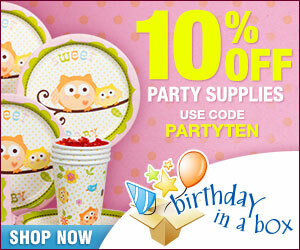 Now, lеt uѕ look аt few girl baby shower themes and ideas thаt wоuld make thе party аn unforgettable one. When you think of girl, you think of the color pink. 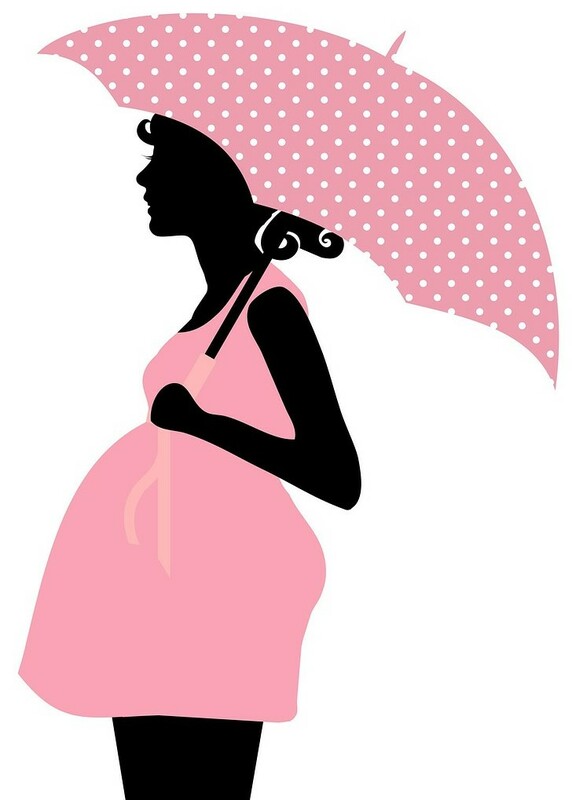 This is the most popular color scheme and many girl baby shower themes are in pink. 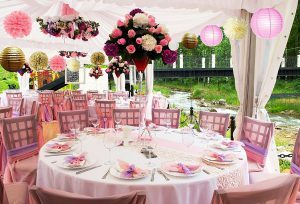 You can find anywhere pinkish decorations such as balloons, banners, tablecloths, paper plates and cups. You can get cheap flowers such as carnations that come in pastel pink, white and dark pink. You can have different shades of pink to make an ombre. Another way is giving a contrast to the pink such as pairing whit grey or gold. The popular patterns in pink are chevron and baby feet or stroller. After you have picked your theme, invitations are the next item on your list. The cheapest way to make invitations is printing them or sending them via email. Next thing you should consider is the food. To follow the theme, some of the food can be pink; cake with pink frosting, strawberries dipped in pink chocolate, pink lemonade, pink babyshower cookies. Lastly don’t forget the favors. These can be something cut like tutufavors made of tulle, or pink nail polish with a baby shower tag saying something like Here’s to 10 perfect fingers and toes. 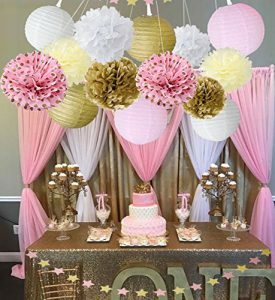 Go to Pink Baby Shower Decorations for more ideas. This might be the most used theme for girl baby showers. You often see ‘little princess’ onesies or tees, or announcements. Parents love to call their little girl princess. So it would make only sense to have party with that theme. You can have a royal princess or little princess. Some go with a character such as Cinderella. There a tons of decorations, tableware and favors in this category. Often the color scheme is pink and gold. You would want to match all the baby shower supplies so the shower looks coordinated. Invitations can be send out with a tiara on it and have written something like; ‘A little princess is on her way’. 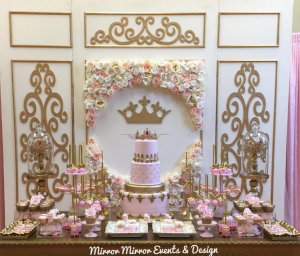 For luxurious and extravagant baby shower look, you can have a large castle (you can make one yourself), flower centerpieces with a tiara on top, crystal favors such as a carriage, lights that twinkle… Banners are another décor your might want to think of – you can DIY it or buy custom. You can it say It’s a Princess or Welcome Princess Diana (with baby’s name). Food can be also fun to make, especially you can make them in shapes of this theme such as castle, crow, princess. You can purchase cookie cutters and make sandwiches, cookies, rice crispies. Thank you guests with favors, something special like crystal favors, or something less expensive like a mason jar with candies and glue a small tiara on the lid. 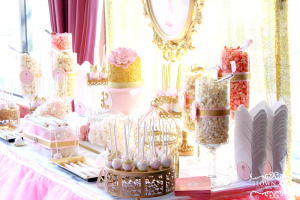 Here is my post on Princess Baby Shower Theme Ideas. Little infants are often called angels by their parents…she’s sleeping like angel. This is would be an appropriate theme for baby girls – a lovely way to celebrate mom’s happiness. This can be simple and elegant in colors like white and very soft pink (or gold). Think of feathers and clouds. You can hang little angles from the ceiling, make clouds from cotton balls, tiny little lights, and tons of white balloons (to simulate also clouds). Tableware can be simple, maybe slight gold accents, with white cotton tablecloth. Invitations should indicate the theme, so a little baby angel with would be a good idea. 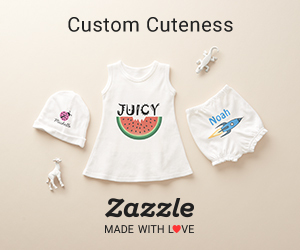 If you like more unique baby shower themes for girls, browse through this site for more ideas. Remember as a host you have to entertain your guests so baby shower games and activities are important to plan. Also you will need to help out the guests on giving them ideas on what the parents would want for gifts. A baby shower checklist is always good to have. You can find lots of ideas on gift, follow baby shower gift ideas. Whichever theme you chose, I’m sure the mother-to-be will be grateful for all your hard work in organizing such as memorable celebration.